We've been struggling this year to come up with great gifts for my parents this holiday season. So after much deliberation, we had a genius idea: A handmade book of poems. "Grandpa loves haikus!" my daughter said. And promptly sat down to compose her own. Loving this idea, we realized a nice cover and some decorative pages were in order. And in the end we were so happy with the results that we agreed this was something to share. So I've made a file available for our simple pages. It comes with a cover in English...and in Spanish. You'll also find some blank pages to go inside the booklet. Print them front and back, then fold them in the middle, stack them, and staple along the center crease. Your child doesn't have to just write haikus either. These pages are prefect for any type of poetry. 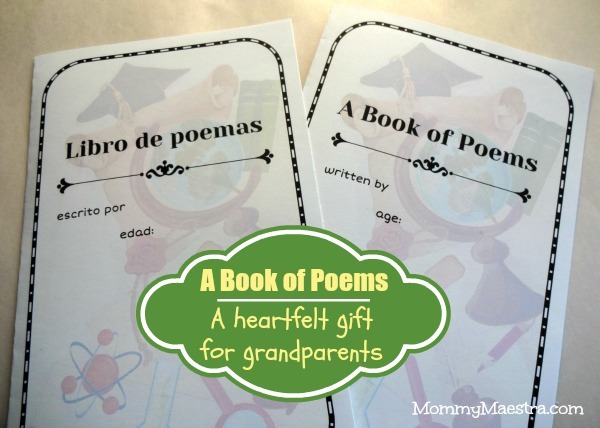 You can even write out your favorite poems by other authors to present to your abuelos (or other family members!). 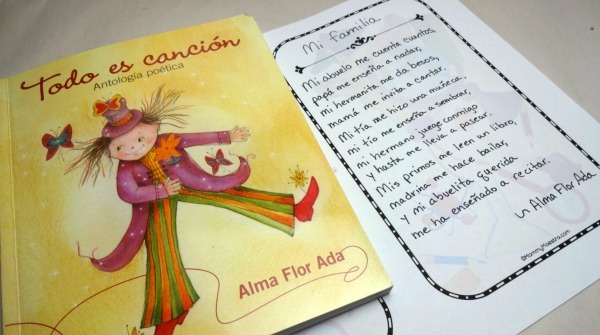 Here's an example: I got out our favorite book on Spanish poems for kids - Todo es canción (aff link) by Alma Flor Ada - and chose a poem perfect to include in a book of poems for los abuelos. I hope that I've taught my daughter that sometimes the most valuable gifts don't cost a lot of money. Sometimes the most valuable gifts come from the heart. From our family to yours, we hope you enjoy this free download to help you give a heartfelt gift this holiday season.